JNN 14 Aug 2014 New York : Pentagon Press Secretary Rear Adm. John Kirby says the United States launched a second round of airstrikes against ISIL Terrorists in Iraq’s Kurdistan region. U.S. launched a second round of airstrikes against Islamic State targets near Irbil on Friday, using drones and fighter jets. “The US military continued to attack ISIL targets near Irbil today conducting two additional airstrikes to help defend the city where US personnel are assisting the government of Iraq,” he said in a statement on Friday. “Four F/A-18 aircraft successfully struck a stationary ISIL convoy of seven vehicles and a mortar position near Irbil. The aircraft executed two planned passes. On both runs, each aircraft dropped one laser-guided bomb making a total of eight bombs dropped on target neutralizing the mortar and convoy,” Kirby said. The first round of the US air attacks was conducted earlier on Friday. 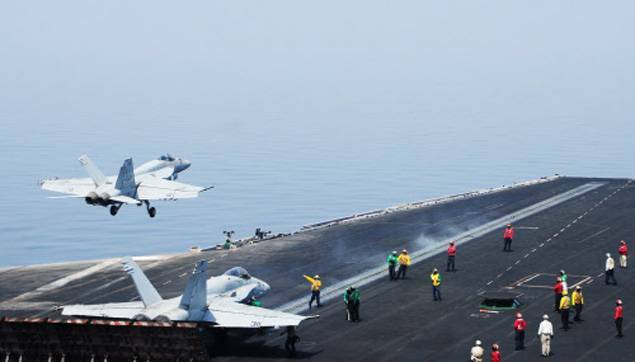 Two F/A-18 combat jets flew from the aircraft carrier USS George H.W. Bush in the Persian Gulf. The aircraft dropped 500-pound laser-guided bombs on a “mobile artillery piece” near Irbil. The United States says it hit the ISIL group after the Takfiris shelled Kurdish forces defending Irbil, where US personnel are stationed. President Barack Obama said late Thursday that the U.S. would launch airstrikes on the militant group that was threatening American military trainers in the northeastern Iraq city. Meanwhile, the White House said it will provide more military support to the Iraqi government once a new “inclusive” government is formed in the country. At least 32 people were killed and 108 others injured in a wave of bombing attacks on Wednesday in Iraq’s capital city of Baghdad, the Interior Ministry said. The attacks included two car bombs in the district of Sadir City, one bomb near the Church of the Virgin Mary in al-Neairiya district and a suicide bombing near a market area in Ur district, Interior Ministry spokesman Saad Maan said in statement. All the three districts are Shiite areas in eastern Baghdad. No group has so far claimed responsibility for these attacks. The security situation began to drastically deteriorate in Iraq on June 10 when bloody clashes broke out between the Iraqi security forces and hundreds of Wahabi Terrorists who took control of country’s northern city of Mosul and later seized swathes of territories after the Iraqi security forces abandoned their posts in Nineveh and other predominantly Sunni provinces. This entry was posted in Iraq News, Middle East and tagged Air Strikes, Iraq, Irbil, IS, ISIL, John Kirby, northern iraq, US Airforce. Bookmark the permalink.